The Kings Hotel in Stokenchurch, High Wycombe is a privately owned and passionately run hotel. The Kings is your ideal choice for accommodation in the High Wycombe area. 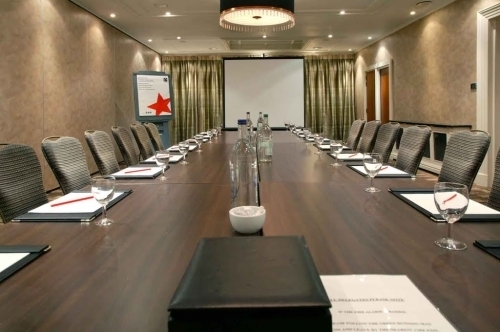 As well as offering the ultimate in comfort, cuisine and leisure, The Kings Hotel provides the perfect venue for your next conference, meeting, wedding or special occasion. Conveniently located near to Marlow, Thame, Aylesbury and Henley this makes The Kings Hotel your ideal base for such events as The Henley Royal Regatta and Royal Ascot. Group bookings are also welcomed. The flagship restaurant in the Kings Hotel, Stokenchurch is the 'Kings Eating House' the perfect place to eat, drink and be merry. Our aim is to serve good honest food, freshly prepared in a wonderfully quintessentially English, quirky environment that makes people feel at home. The menu is a blend of classics with a twist, home-cooked comfort food and dishes to satisfy the most discerning diners. Great stay overall and the customer service was excellent! Shame that toothpaste was not provided but this is really just a minor niggle. I was pleasantly surprised that that towels were changed and room arranged every day despite lowered staff levels over Christmas. We have stayed with you on many occasions the staff are always very cheerful and helpful. We do feel the bedrooms need updating as they are dark, small & dated. We didn't even have a lampshade on our bedside lamp. Would definitely stay again but look forward to some improvements. &nbsp;Lovely public spaces but the rooms are a bit small, dark and dated. However the staff were delightful and charming. The hotel and the restaurant facilities are excelent. Please give my regards to the lady responsible for breakfast.She was absolutely perfect. I'm a Regular visitor here. Had my wife's 60th Birthday party this last week. Everything was just great from the initial organization, recommendations for the DJ & Photo booth company and the overall experience and assistance. Pleasing overnight stay breaking a long journey home. Overall we all had a good stay and food and service was excellent, will be coming back. We came to celebrate our first year's anniversary after getting married the previous year. Food was superb and we totally enjoyed our relaxing stay reflecting on the great memories of our wedding day. The food was really tasty and service was very good. All the staff is very helpful and friendly. Our stay was excellent value for money with a groupon voucher. The staff were extremely helpful, friendly and polite which significantly contributed to our enjoyment. The food was tastey and fresh, particularly the ice cream, although we found the portions unnecessarily large. The drinks seemed reasonably priced. The room was pleasantly furnished but may have been rather small for a longer the stay. The only negative was that the bathroom smelt a bit damp. Very adequate and good value for money. Would not hesitate to return. Overall very good. Would come back. We stayed for one night with a Groupon deal. The room was clean and comfortable, though there was an empty shampoo bottle from the previous guest. The room was on the second floor and had very small windows and no views, however this was done for all the best intentions as there was also a wedding reception in the hotel, which meant music etc which would have disturbed us on the first floor. The service and the quality of the food was excellent and for this reason I would wholly recommend this hotel, which is good value for money. The food was great and the service was fabulous. Food was out of this world. Very lovely and well presented. As you know when I last stayed on 2 separate occasions in January I was disturbed by noise during the night, but this time everything was fine. Excellent service and unbelievable value for money. The batter on the fish is too thick. I am recuperating after an operation and it was a well needed relaxing one night break. I would recommend to my friends looking to get away for a midweek or weekend break. This place has always been a treat for me and the service is fantastic. Can't wait to go back and Craig is always very welcoming. very friendly staff and lovely room. We had our Christmas party there and everything was handled perfectly - we will come again! Great time at the Kings! Great hotel - Good value, with excellent food and service. Really comfortable bed, and even though a number of weddings going on a peaceful night's sleep. Wow what an amazing evening,.... staff amazing... food was wonderful this year last year was good this year wonderful, congratulations to the kitchen....... and the rooms superior....... breakfast .. scrummy..... the new dj was the best.... bring on 2014.
lovely attentive staff and great food. Lovely food. Great service. Top notch! Fab meal, food was delicious. Fab meal, food was delicious. Been here many times and it is still good ! Excellent food and service, menu jus right, setting v cosy . Great'thanks to all. Very happy to be here on kings!!! A lovely evening with our special friends from Cyprus. Another fantastic evening, wonderful food, and the same professional yet friendly service. A lovely evening with our special friends from Cyprus. Now privately run, and thankfully no longer owned by Best Western, there has been considerable investment in the Kings Hotel to bring it up to an acceptable standard.The decor and fittings throughout are tasteful and ensure a comfortable night if you're on business, and it's 500 yards from M40 Jct 5. The bar has nothing decent on draught, an unexciting wine menu and standard spirits. The restaurant serves posh grub in the cliche sense of the word - not good enough to be gastro but better thansc#mpi and chips or cottage pie.When you look at what's on offer within 10 miles though for a leisure stay you'll not really have The Kings in your top 20... There are so many picturesque country hotels and pubs in the nearby Chiltern countryside that deliver a more unique experience with personal service meaning The Kings will not really ever be much more than an acceptable standard Business hotel.